International flights arrive by evening. A driver will meet you at the airport and transport you to Guango Lodge in the eastern Andes, about an hour's drive from the airport. Night at Guango Lodge. Morning at Guango Lodge and reserve, a high elevation site near the village of Papallacta. The main attraction for photographers at Guango is the many hummingbird feeders just outside the entrance to the lodge dining area. The feeders are well positioned so that hummingbirds stage on nearby shrubbery or low tree limbs, allowing photography in nature settings away from the feeders themselves. Up to 15 species of hummingbirds vie for perches and feeding stations. Photo opportunities are some of the best in Ecuador. Species typically present are Sparkling Violetear, Buff-tailed Coronet, Chestnut-breasted Coronet, Mountain Velvetbreast, Collared Inca, Buff-winged Starfrontlet, Sword-billed Hummingbird, Tourmaline Sunangel, Glowing Puffleg, Purple-backed Thornbill, Tyrian Metaltail, Mountain Avocetbill, Long-tailed Sylph, White-bellied Woodstar, and Gorgeted Woodstar. The path through the gardens is worthwhile exploring, especially early in the morning. The path is basically a grassy area surrounded by gardens and secondary growth along the river. There is also some forest edge where forest species often appear. Torrent Duck and White-capped Dipper are sometimes found along the river, and birds such as Black-capped Hemispingus, Black-eared Hemispingus, Gray-hooded Bush Tanager, Hooded Mountain-Tanager, Lacrimose Mountain-Tanager, Blue-and-black Tanager, Capped Conebill, Masked Flowerpiercer, and Slaty Brush-Finch can often be found and photographed in the gardens. After lunch transfer to San Isidro, a middle elevation site downslope from Papallacta. After arrival, photograph birds on the lodge grounds. The grounds around the dining area and cabanas have paved and stone paths through gardens and forest edge. 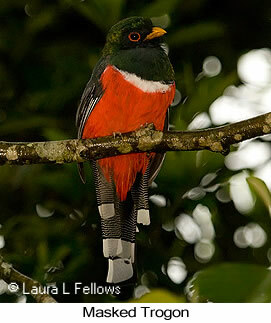 These offer very good opportunities to photograph Masked Trogon, tanagers, and flycatchers. Shortly after dark look for and photograph the mysterious "San Isidro Owl", a bird intermediate in plumage between Black-and-white Owl and Black-banded Owl. No one quite knows what this owl is. It may be a separate species or a sub-species new to science. 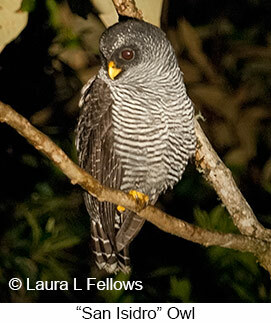 The owl is usually present and easily seen around the lodge walkways. Night at Cabanas San Isidro. Early morning will be devoted to photographing antpittas that can usually be lured onto a trail not far from the dining room. Two species usually appear, Chestnut-crowned Antpitta and White-bellied Antpitta. The remainder of the day will be spent photographing birds in the San Isidro Reserve, private property owned by the lodge. Several trails go through secondary forest, where it's sometimes possible to see and photograph Crested Quetzal. Also possible is Golden-headed Quetzal. Among the other birds that could be found and photographed in the forest and along forest edge are Andean Motmot, Crimson-mantled Woodpecker, Orange-eared Tanager, Golden-naped Tanager, Blue-necked Tanager, and Beryl-spangled Tanager. Some different species of hummingbirds are present at feeders near the dining room. Hummingbird photography is not as good as it is at Guango Lodge because there aren't many places for them to stage, but the hummingbirds are still fascinating to watch. New species include Tawny-bellied Hermit, Bronzy Inca, Green-fronted Lancebill, Violet-bellied Hummingbird, and Fawn-breasted Brilliant. Night at Cabanas San Isidro. Early morning we'll have a second chance to photograph antpittas as well as other birds near the dining room on lodge grounds. After breakfast transfer back to Guango Lodge, arriving by lunch. Afternoon photograph birds around Guango Reserve. Night at Guango Reserve. Following early breakfast, transfer to Quito airport for flight to Baltra Island, gateway to the Galapagos. Upon arrival, transfer across the island to meet the boat. There you'll encounter the first Darwin's finches, the ubiquitous Small Ground-Finch and Medium Ground-Finch. Also likely is the striking Galapagos Dove. Board the 16-passenger yacht, sail to nearby Bachas Beach on Santa Cruz. Present in the harbor are Elliot's Storm-Petrel and other seabirds such as Brown Noddy. At Bachas Beach disembark for an easy walk along sandy beaches and through dunes. Here expect American Flamingos, various shorebirds, and Galapagos Mockingbird. After returning to the yacht, sail overnight to Genovesa Island, arriving before dawn. Genovesa is the only northern island in the Galapagos accessible to visitors. Morning disembark at Darwin Bay. The white sand beaches feature Galapagos Sea Lion, Galapagos Fur Seal, and lovely Swallow-tailed Gulls. 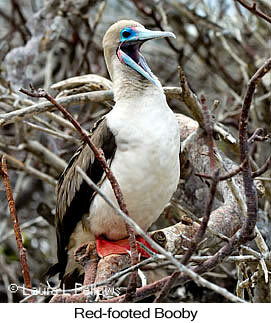 Here you'll be in the midst of a spectacular nesting colony of Red-footed Booby. This species nests year-round in the tangled mangroves and is the most common booby in the Galapagos, but it is rarely seen anywhere other than Genovesa as it feeds far at sea. Nazca Boobies are courting from May-August and attending nests from August-January. Genovesa is the only island where Sharp-beaked Ground-Finch can be found and is one of the few places to find and photograph Large Cactus-Finch. Also present is the Large Ground-Finch. Afternoon climb Prince Phillip's Steps, a natural stone "staircase" on the south side of the bay (rather steep and can be difficult for some people). 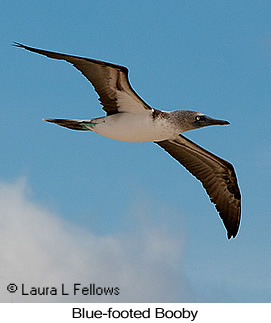 Nesting Red-footed Booby and Nazca Booby colonies are present in this area as well. Above the incline, a path through the tangled forest of dwarf Palosanto leads to the other side of the island. The thick tangle of dwarf trees is home to a significant colony of Great Frigatebirds. Farther along the trail is the only place to find the Galapagos subspecies of Short-eared Owl, a difficult bird to actually spot as it is well camouflaged when sitting still. The far end of the trail reaches a cliff where large numbers of Wedge-rumped Storm-Petrels nest. While transferring between islands, a number of seabirds can be seen including Galapagos Petrel, Band-rumped Storm-Petrel, and Wedge-rumped Storm-Petrel. Overnight sail to Bartolome Island. Morning disembark on Bartolome Island, a small volcanic island near Santiago Island. Pinnacle rock is one of the famous landmarks of the Galapagos and is one of the few places where Galapagos Penguins are found. You'll also likely see and photograph the endemic Galapagos Hawk, which is only found on a few islands. Walk the path up to the peak, 240 ft above sea level, for a panoramic vista and the most photographed view in the Galapagos. Afternoon visit Sullivan Bay on nearby Santiago Island. The beach offers some of the best tide pools in the islands. Reddish-black marine iguanas and Galapagos Land Iguanas are common. 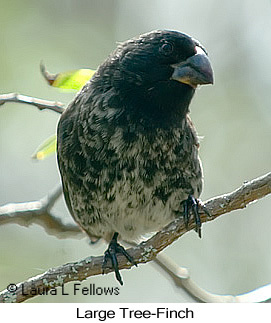 Ten species of Darwin's finches are found on the island, most notably the endangered and very rare Mangrove Finch. Other Darwin's finches on the island include Green Warbler-Finch, Vegetarian Finch, Woodpecker Finch, Large Tree-Finch, Small Tree-Finch, Small Ground-Finch, Large Ground-Finch, Medium Ground-Finch, and Large Cactus-Finch. Evening sail to Santa Cruz Island. Morning visit Black Turtle Cove, a red mangrove lagoon on Santa Cruz. You'll go into the lagoon in paddle boats, where the main attractions are nesting Green Sea Turtles and an abundance of White-tip Reef Sharks, Hammerhead Sharks, Golden Rays, and Spotted Eagle-Rays. Afternoon visit Dragon Hill on Santa Cruz, an inland site reached by vehicle. Dragon Hill is a very dry area where the main attraction is a small population of Galapagos Land Iguanas. Some birds to be found there are White-cheeked Pintail, Large Ground-Finch, and Common Cactus-Finch. Morning visit famous Charles Darwin Station in Puerto Ayora, where many Galapagos animals are on display. Marine iguanas, Lava Heron, and various other birds are found around Academy Bay where you'll dock. Elliot's Storm-Petrel are common there. Afternoon visit the highlands to view and photograph Giant Tortoises at one of the very few places they are still found in the wild. 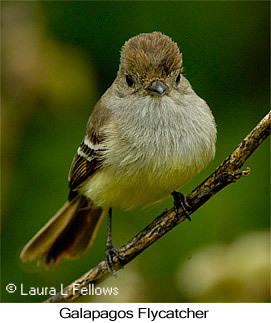 Notable birds of the highlands are Galapagos Flycatcher, Small Tree-Finch, and Woodpecker Finch. Overnight sail to Floreana Island. Morning visit famed Post Office Bay and Cormorant Point on Floreana Island. Post Office Bay got its name from its usage by early settlers as a place to leave messages. A small trading post and museum documents the colorful history of the island. Floreana is the only place to see and photograph Medium Tree-Finch. 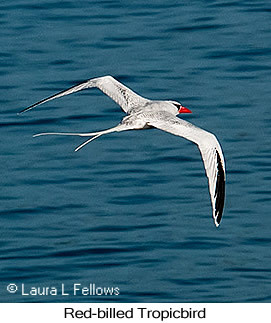 A number of marine birds can be seen around Floreana, including Galapagos Penguin, Red-billed Tropicbird, and Swallow-tailed Gull. Of particular interest is nearby Champion Islet, one of only two tiny islands where the endangered Floreana (Charles) Mockingbird still persists. The bird can often be seen and photographed along the rocky shoreline without going ashore, which is now prohibited. Boat captains are usually willing to skirt the shoreline upon request from passengers. Overnight sail to Española Island. 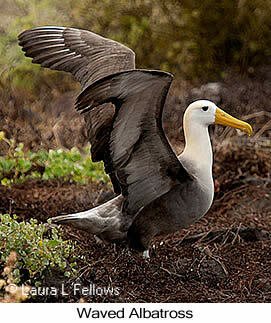 Española is best known for the only Waved Albatross nesting colony in the Galapagos. The albatrosses arrive in late March and spend the following month courting. Their courtship ceremony is both intriguing and photogenic. Egg laying begins in mid-April and continues into June. Birds remain in the colony until early December and then depart for the open sea until the following March. Depending on where the boat lands on the island, reaching the colony can be a short walk or a rather long walk across the island. Española also features nesting colonies of Red-billed Tropicbirds on the cliffs and Blue-footed Boobies in the interior. The island is the only place to find the Española (Hood) Mockingbird and is also home to the Gray Warbler-Finch. It's one of the few islands where one can see and photograph the Galapagos Hawk. Overnight sail to San Cristobal Island. Morning look for and photograph San Cristobal (Chatham) Mockingbird, which is only found on San Cristobal. Also look for Gray Warbler-Finch, Vegetarian Finch, and Woodpecker Finch. Visit interpretation center as time permits. Mid-day flight back to Quito. Transfer to hotel in central district, an hour or sometimes more drive from the new airport. Unfortunately, there are still few hotel options near the airport and the only decent hotel is difficult to book and more expensive. We can attempt to substitute that hotel upon request for additional charge. Night at Hotel Sebastian in Quito. Early booking is required to ensure space on the boat. Price does not include park entrance fee ($100), flights to/from the Galapagos (approx $420). 30% deposit due upon registration. The remaining payment is due 4 months prior to departure, at which time all deposits are non-refundable. Birding guide in Andes included in price.